The DBSO (Driving Brake Standard Open) coaches were converted at Glasgow Works from 1974-built Mk2f BSO coaches. The rebuild involved fitting the brake-van end with a half-cab and an EMU style power controller linked to a TDM transmitter. The TDM (Time Division Multiplex) system sent pulsed control signals through the carriage lighting control circuits. This system meant any air-braked coach could be include in the formation. Worked with TDM translator fitted Push-Pull Class 47/7 locomotives. Initially used on the Edinburgh Waverley - Glasgow Queen Street (E&G) route. Trials started in August 1979 and the first DBSO push-pull set in passenger service ran on 22nd October 1979, powered by locomotive 47709. Further sets were introduced to replace the class 27 push-pulls by February 1980. 9706 cut up after Polmont crash in 1984. Obstacle Deflectors fitted in 1985 in response to Polmont crash. Repainted in ScotRail Express livery between Autumn 1984/Spring 1985. 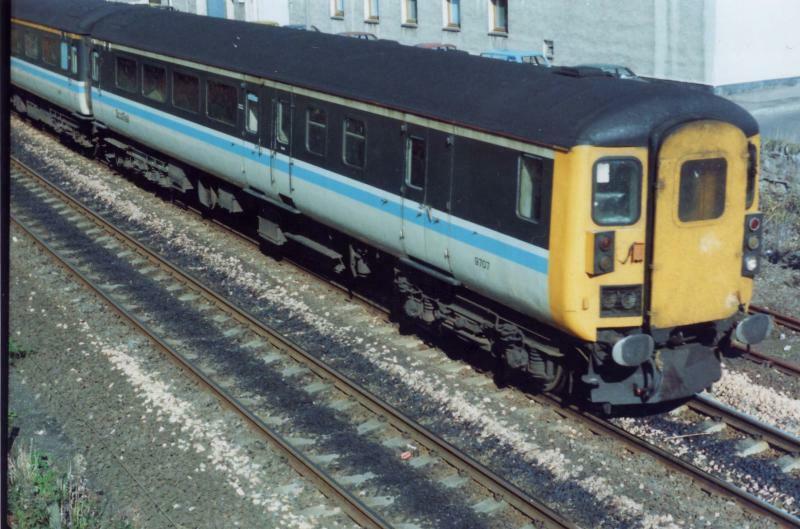 Extra DBSOs were converted for use on the Glasgow - Aberdeen route from May 1985. Whether on Edinburgh or Aberdeen duties, the usual formation had the DBSO at the Glasgow end of the train. The DBSOs were transferred away from Scotland in May 1990, for use on the London Liverpool Street - Norwich route. At this time they overhauled at Derby works, the cab end gangways were removed, and updated TDM equipment compatible with electric locomotives was fitted. Created by Dysgraphyk and last modified by scot-rail admin at 13:38, 01 of July 2007.